It's happening again -- I'm backlogged with baby gifts! I managed to get one done (the hat in the previous entry), and now I'm working on a sweater for the brand new daughter of a high school friend. I hate that not only did I miss her shower, but I didn't get her this sweater before the baby was born. Ugh! Anyway, I'm trying my hand at the Bulky Baby Bibby (scroll down!) in Dance by Artful Yarns. I'm using the color Jig. I had planned to use Berroco's Pronto since Alison had enjoyed it so much, but the yarn store I went to didn't have it. I was rushed and didn't have time to go to another store, so I was happy when I found the Dance on sale -- half price! I started out with the Bigger Bulky Baby Bibby (charmed by the picture, as Alison was! 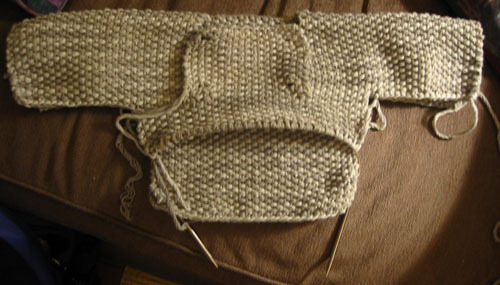 ), but by the time I got to the split for the neck, it was obvious that I didn't have nearly enough yarn. So I ripped it all out and started in the smaller size -- I'll have plenty of yarn, even enough to make a matching hat, I think. Hey, there's that beautiful bulky baby bibby! That color is so pretty. Great yarn. (Of course my links have changed - my bulky baby bibby is at http://alison.knitsmiths.us/blueroom_fips/blueboy.html now.) Love that pattern!